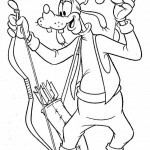 Welcome to our Goofy coloring pages! 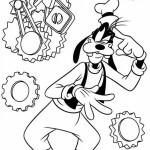 On this page you can find some very nice Goofy coloring pages which you can color as you’d like, but you can also find some very interesting information about Goofy. 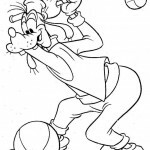 Goofy is an animated cartoon character from the Walt Disney’s Mickey Mouse universe. He is one of Mickey Mouse’s best friends. 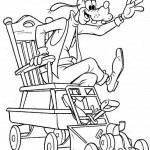 His original concept name was Dippy Dawg in cartoon shorts created during the 1930s; then his name was given as George Geef or G.G. 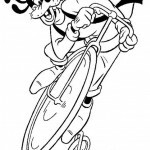 Geef in cartoon shorts during the 1950s, implying that Goofy was a nickname. 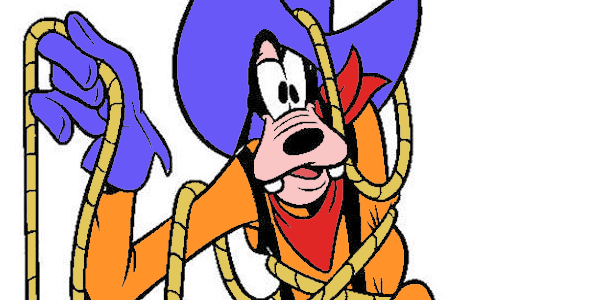 Contemporary sources, including the Goof Troop television show and A Goofy Movie, now give the character’s full name to be Goofy Goof. The Goof Troop pilot also refers to G. G. Goof on a diploma, likely a reference to the 1950s name. On the other hand, the comics sometimes refer to him as Goofus D. Dawg. 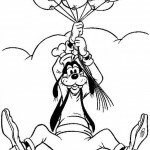 Along with being not intelligent, Goofy’s main flaw is, predictably, clumsiness. His birthday is May 25, 1932. 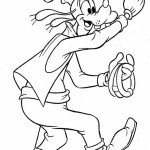 Of Disney studio animators, Art Babbitt is most regarded for the creation of the Goofy character, while original concept drawings were by Frank Webb. In a 1930s lecture, Babbitt described the character as “a composite of an everlasting optimist, a gullible good samaritan, a halfwit and a shiftless, good-natured hick”. 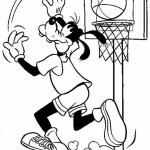 Goofy’s (unnamed) wife has appeared – but always with her face unseen – in 1950s-produced cartoon shorts depicting the character as a “family man”. Goofy’s wife dies later on and Goofy states to Max “she up there with the stars” so his modern day appearances portray Goofy as a widower. While raising his son, Max Goof, Goofy’s family life contrasts with other major Disney characters such as Mickey Mouse and Donald Duck, who are always shown only as uncles rather than parental figures. 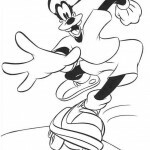 (In comic books, Goofy was regularly featured as having a nephew, Gilbert, but that character has only existed in comics, with no cartoon appearances.) 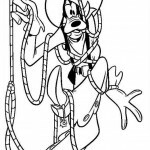 In the European comic books, Goofy has an adventurer cousin called Arizona Goof (original Italian name: Indiana Pipps), who is a spoof of the fictional archaeologist Indiana Jones. 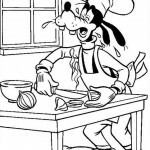 Goofy’s catch phrases are “gawrsh!” (which is his usual exclamation of surprise and his way of pronouncing “gosh”), along with “ah-hyuck!” (a distinctive chuckle) which is sometimes followed by a “hoo hoo hoo hoo!”, and especially the Goofy holler (see below). Pinto Colvig, who was a man of primarily one voice, would incorporate the unique laugh and speech pattern into otherwise unrelated cartoon characters that he voiced. Now that you’re done reading, you’d better move on to our Goofy coloring pages quickly!